With Desktop Point of Sale, you know you’re getting the quality and support of the QuickBooks brand with every transaction. Easy to get started. Retailers can get up and running quickly by answering a few questions with the simple Setup Wizard. Interactive video tutorials walk retailers and their employees through how to complete everyday tasks. • New! Web store. Now it’s easier than ever for retailers to expand their store to reach customers online. The new Intuit Storefront for QuickBooks Point of Sale service provides retailers with everything they need to start selling online – from designing and hosting their web store, to managing all inventory, to attracting customers, all in one place. It syncs seamlessly with the QuickBooks Point of Sale 8.0 software. –– Track customer information that matters. By recording information, such as e-mail and shipping address, retailers can alert their customers to upcoming sales and other events. –– Easily communicate with customers. QuickBooks Point of Sale integrates with Microsoft Word so retailers can quickly generate letters to their customers and vendors.1 The feature automatically creates letters (from standard and custom templates) that are tied to customer orders, former receipts, purchase orders, vendors and more. Retailers can also send letters to a set of customers, such as best customers or those who have ordered over a certain amount. • New! Simple Sales Receipt View. 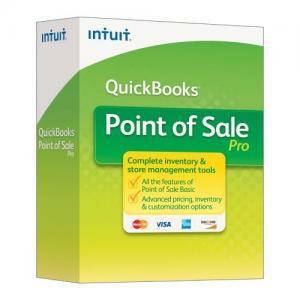 Sales associates can learn to make sales in seconds with QuickBooks Point of Sale’s simple interface. The clean look doesn’t have a lot of distracting extra options, and the large buttons and easy scroll options make it great for a touch screen. • New! PIN Pad with Signature Capture. Improve security and save time by allowing customers to sign for a credit card transaction directly on the PIN pad. An electronic copy of the signature is recorded for later retrieval in case of contested charges, and the retailer can enjoy improved security and reduced paper clutter. • Improved! Tax Summary & Reporting. The improved sales tax summary and detailed reports make it easier for retailers to see how much is owed to each tax agency and how to reconcile that amount against sales history. • Item Pictures. Merchants can easily upload item pictures directly into QuickBooks Point of Sale. Pictures can also be easily uploaded to a company’s Web site with the Easy Export feature or used as a reminder when ordering. Pictures can also help prevent loss by catching price tag switching. • On-hand Inventory. QuickBooks Point of Sale users can easily see whether inventory is available for sale or already committed to a customer. Closing out a past month can be difficult if a retailer doesn’t know the exact quantities of inventory it has on hand, but the Inventory Valuation report makes it simple to pull up inventory data for any given date. • New! Retailers can now manage up to 20 stores from one location and see from a glance how each store – and the whole chain – is doing. QuickBooks Point of Sale Pro Multi-Store gives retailers the capacity to have up to 20 workstations in 20 different stores. With room for expansion, small retailers can envision, plan and manage their growth, and won’t grow out of their system.